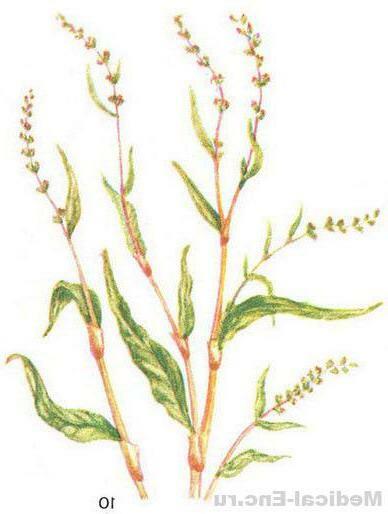 Highlander pepper, water pepper (Polygonum hydropiper L.) is a wild plant. Active substances - flavonoids. Extract liquid (30-40 drops 3-4 times a day) and the infusion of herbs (20 : 200, 1 table, L. 2-4 times a day) is used as a styptic funds tied with gemorroidalnyh bleedings. Part protivogemorroidalnyj candles "Anestezol". Highlander pepper, water pepper. It can be found on the banks of streams, rivers, lakes, marshes, wet meadows and groves, drains, along roads, as a weed in gardens. The eyelander pepper five twins, who like him, growing together with them, and gather them should not be. It is therefore important to know the hallmarks of water pepper. The main thing that distinguishes it from others - burning taste, and pepper because it is called. But dry grass, and pungency disappears. Highlander pepper - annual grassy plant up to 70 cm high, with branchy, hollow, at the bottom are often held knotted stems. By autumn they sometimes turn red. The bell formed by two stipules accrete, brownish. Inflorescences metallovedenie, long, intermittent, drooping, with a small greenish, often pink flowers. The perianth lined the gold points. True, they can only be viewed through a magnifying glass, but it is a sure sign that you have found a plant - water pepper. His doubles such does not. Highlander pochechuynogo also should not get into the charges of water pepper. Prepare a grass of water pepper during flowering, before red stems. It should be cut at a height of 4-5 cm above the ground. Dry grass need a thin layer, turning often. But the sun she is black, but if you long to dry - yellow and even can decay. Highlander pepper was known to the ancient Greeks and Romans. Used it as a means of cleansing the wound and destroy tumors. Alchemists believed he was a very valuable plant. Have long been used in China as an external irritant tool or as spicy seasoning to dishes. Recommended that the juices to lubricate ulcers in animals that flies would not sit on them. Now it occupies a well-deserved place among medicinal plants as a hemostatic means.